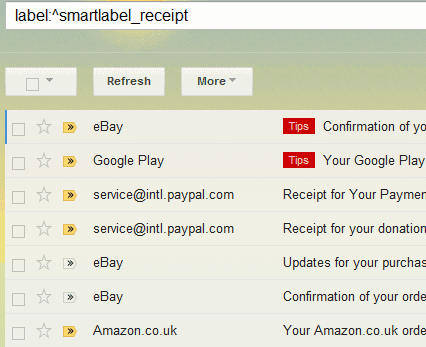 Here's a way to find your receipt messages from Gmail: search forlabel:^smartlabel_receipt. This feature is powered by the Smart Label experiment from Gmail Labs, but you don't need to enable that experiment. I've found receipts from PayPal, Google Play and Google Checkout, order confirmations from eBay, Amazon and other shopping sites. 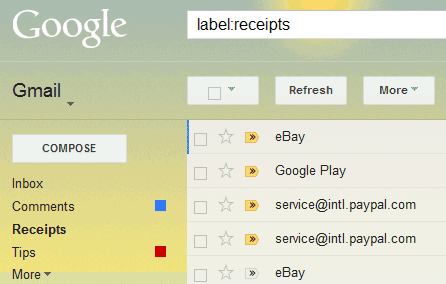 Gmail automatically detects receipts, just like it finds notifications, social updates, forum messages and other categories of messages.